This entry was posted in Buckinghamshire, History, Wales and tagged Buckinghamshire, Counties, exclaves, Flintshire, Hertfordshire, John Milton, Wales by Rob Skinner. Bookmark the permalink. I forgot to mention yesterday that, as you said, South Glamorgan was established 40 years ago on 1 April 1974. I started work in the new London Borough of Hounslow on its first day 1 April 1965. 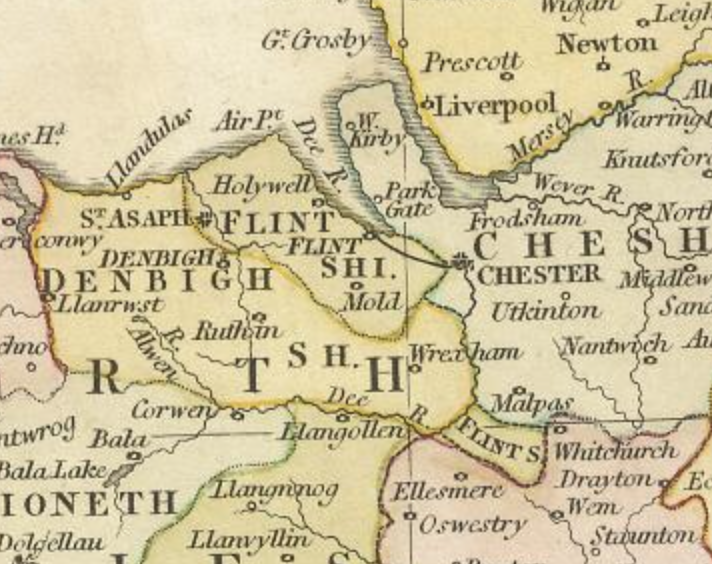 The situation with the exclaves of Flintshire was considerably more bizarre than you’d detected from your school map. There were several other small areas, surrounded by Denbighshire known collectively as ‘parts of Flintshire, detached’. The anomaly showed up when following referenda about Sunday drinking, Flintshire went wet and Denbighshire stayed dry. Thirsty men suddenly discovered an urge to stroll, catch buses and supervise driving lessons. I’ve heard accounts of the border running though a pub in Marford with the result that they could open the lounge but not the bar. Not sure this is true as it’s too close to a story in the Spike Milligan novel ‘Puckoon’ about a pub straddling the Ulster border and because surely a pub has to be licensed with one county or the other? I’d love to know how they emptied the bins. For all that enclaves are quaint historical survivals, you don’t have to think too hard to realise that they’re generally indicative of tension, strife or historical bloodshed. Gunter Grass’s novel The Tin Drum talks about the first day of World War Two as having occured in Gdansk, aka ‘The Free City of Danzig’, essentially a little bit of Germany left behind in Poland that turned out to be bridgehead. For all the nostalgia that ‘historic counties’ can evoke, I’m a local government officer myself and am much in favour of sensibly shaped and constituted counties that can do the stuff that makes life easier for the citizen body. Thanks for the really interesting comment. Much appreciated. The reference to Danzig reminds me of my history lessons at school! By coincidence, at the time of those lessons it was in the news as Poland’s Solidarity movement started in Gdansk.